Treat your hair to the nourishing properties of HAIRFINITY's Gentle Cleanse Shampoo, an intensely hydrating hair cleanser that lifts away dirt and impurities from the hair and scalp without stripping essential moisture. Gentle enough for daily use, the shampoo utilises an exclusive Capilsana® Complex that delivers a unique blend of bioactive Hydrolyzed Collagen to strengthen and revitalise hair; it provides naturally occurring building blocks for healthier, more resilient locks that are less prone to breakage. Infused with a host of beneficial ingredients, including Aloe Vera, Chamomile extract and Biotin, the shampoo gently cleanses whilst softening and refreshing. 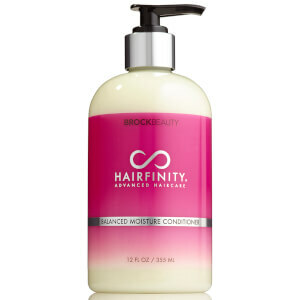 Shine is increased; moisture is restored; hair is nourished and protected against dryness. Infused with a relaxing scent powered by Sea Salt, Hibiscus and Essential Oils. Formulated with over 74% natural ingredients. Aqua (Water), Aloe Barbadensis Leaf Juice (Aloe Vera), Sodium C14-16 Olefin Sulfonate, Cocamidopropyl Betaine, Coco-Glucoside, Glyceryl Oleate, Glycol Distearate, Laureth-4, Glycerin, Fragrance, Phenoxyethanol, Caprylyl Glycol, Sorbic Acid, Sea Salt, Sodium Citrate (Vitamin C), Biotin, Dimethyl Sulfone (MSM), Organic Lavandula Angustifolia Oil, Thuja Occidentalis Leaf Oil, Organic Cinnamonum Zeylanicum Bark Oil, Rosmarinus Officinalis Leaf Oil, Thymus Vulgaris Flower/Leaf Oil, Organic Mentha Piperita Oil, Calendula Officinalis Flower Extract (Marigold), Chamomilla Recutita Flower Extract (Chamomile) , Hydrolyzed Collagen, Equisetum Arvense Leaf Extract (Horsetail), Tocopherol (Vitamin E), Disodium EDTA.